Nate DeSisto faced a dilemma experienced by many college underclassmen early last year — whether his heart was truly into his chosen academic pursuit. But one impromptu walk through an open door on campus not only led the Worcester Polytechnic Institute sophomore from Orono back to a past sports-related interest, but it also provided some future direction. “I was literally just walking to one of my classes, and I went through this building, and there was a door open, and it was a sports engineering lab,” said DeSisto, a former basketball standout at Orono High School now studying mechanical engineering at WPI in Worcester, Massachusetts. That chance meeting led to a job offer for DeSisto to join a team of student engineers at WPI that is developing a new sports shoe. Its sole is designed to reduce the frequency of noncontact knee and ankle injuries among professional and amateur athletes. DeSisto is one of 12 undergraduates and two graduate students working on the project under the direction of WPI professor of mechanical engineering Christopher Brown. DeSisto is not participating in a sport at WPI. 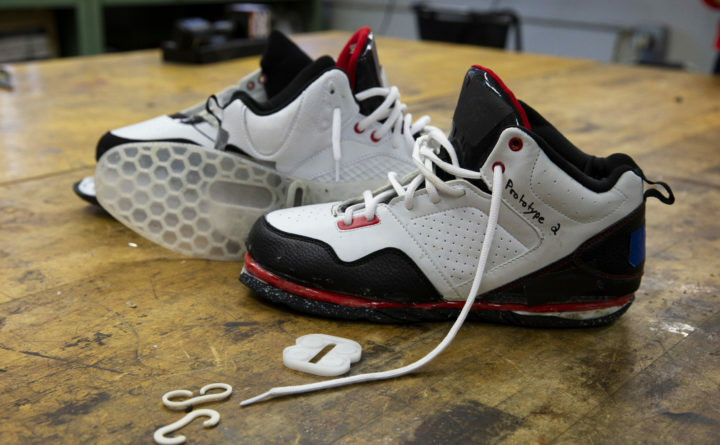 The WPI shoe endeavors to limit loads to the ankle and knee, with its key design element a set of “goat’s-head springs” — tiny, flexible polymer pieces inserted into the sole whose name is a reference to WPI’s mascot, Gompei the Goat. The springs are curled like goat’s horns and wrapped around tiny posts that restrain their deformation, allowing the energy involved in the athlete’s cutting movements to be absorbed by the shoe instead of the ankle or knee. The WPI team spent much of this past fall working on preliminary prototypes of the shoe with an eye toward on-court testing. DeSisto’s contributions come on the manufacturing end of the process. “We’ll receive a design and figure out how to make a part from that design,” he said. Work on the shoe sole, for which WPI has received an initial U.S. patent, began in 2012 and received a boost in 2017 from Ed Cowle, CEO of New York-based Sports Engineering Inc. SEI has invested more than $400,000 in the project and has an exclusive license to the patent as well as future intellectual property from WPI. WPI holds equity and will receive royalties on the shoe. For DeSisto, the opportunity to work on the project marks the continuation of a relationship with sports footwear that initially was heightened during his middle-school years. “Me and my buddies, when we were younger, would buy used shoes online and try to fix them up and sell them for more money,” he said. “That’s where I got a passion for shoes, and me and my buddies would buy shoes for each other for birthdays. We did that a few times. DeSisto hopes this introduction to athletic footwear engineering may lead to a career calling beyond graduation. “Honestly it’s a dream come true because I was going through my freshman year, and I wasn’t really sure what I wanted to do with engineering yet,” he said. “But once I got near the sports engineering lab my interest went up a ton. This is something I’m passionate about and having fun doing at the same time.